Scotland lay on the northwest frontier of the vast Roman Empire. It is not surprising therefore that all surviving monuments of that time are military in nature, including the remains of forts, towers and roads. There is no doubt however, that the most magnificent Roman military monument left in Scotland today is the impressive remains of the Antonine Wall. The Roman Emperor Antoninus Pius (see picture to the right) ordered the building of his Antonine Wall in AD 140 to bring some order to that troubled outpost of the empire. Building actually started around AD 142 and is thought to have taken six years to complete. 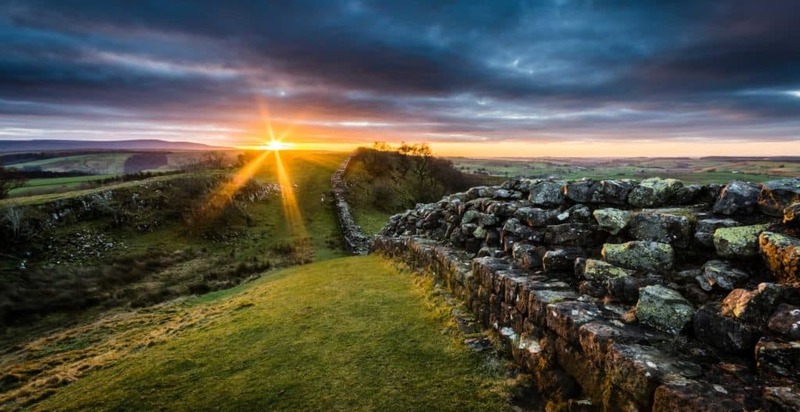 Running from east to west, and stretching some 37 miles long from modern Bo’ness on the Firth of Forth to Old Kilpatrick on the River Clyde, the wall marked the extent of the Roman military advance northwards from the existing frontier of Hadrian’s Wall. It was the Roman general, Quintus Lollius Urbicus, who was tasked with the building of the wall. The purpose was apparently to defend the frontier from raids by those pesky Caledonians (northern Britons who had developed a troublesome habit of sending raiding parties south, in order to relieve their richer southern neighbours of some of their wealth)! When complete, the Antonine Wall comprised a bank of turf almost 3m high and 4m wide, topped with an imposing wooden palisade. Between sixteen to nineteen forts were built along the length of the wall to house the many hundreds of Roman soldiers that manned this brave (but chilly) new frontier. On the north side a deep ditch was dug to further impress and deter the Caledonians, and on the south, a road was constructed in order that the Roman soldiers could be moved to trouble spots quickly. But it appears that even the deep ditch, sturdy structure and imposing palisade of the Antonine Wall failed to impress those Caledonians. Their raids into the richer south continued on a regular basis, ably assisted by other tribes from that part of northern Britain. The Roman defenders appear to have got a little fed up with this constant harassment and finally abandoned the wall in about AD 165, less than twenty years after its completion! Later visitors to the wall appear to have been a little more impressed than the Caledonians, as many centuries later its remains became known as the Devil’s Dyke, because people could not believe that it had originally been built by the hand of man. The Wall is under the care of Historic Scotland. Despite the passage of time, substantial lengths of this remarkable monument can still be seen at various sites. One of the best viewing points is near Bonnybridge, where the line of the Antonine Ditch and Wall can be clearly seen running for quarter of a mile through Seabegs Wood, to the south of the Forth and Clyde Canal. At this point the ditch is still some 40 feet wide, but only 6 – 8 feet deep. In places, the rampart survives to a height of 4 feet. Another good viewing point is at New Kilpatrick Cemetery where the stone base of the wall is clearly visible. The Roman Bathhouse in Bearsden is located on Roman Road, Bearsden, Glasgow and is signed from Bearsden Cross on A810. The well-preserved remains of the bath-house and latrine, built in the 2nd century AD, used to serve a small fort. A number of other, less well – preserved sites exist near Falkirk, where interpretive display panels describe each location for visitors. These are at Kinneil Park, Callendar Park, Polmont Hill, Rough Castle, Kemper Avenue, Anson Avenue and Tamfourhill Road in Falkirk, Underwood Lock (Allandale) and Castlecary. The map below shows the approximate route of the Antonine Wall (black), along with the route of Hadrian’s Wall (grey). Browse our interactive map of Roman Sites in Britain to explore our listing of walls, villas, roads, mines, forts, temples, towns and cities. The most prominent and important monument left by the Romans in Britain, it spans the width of the country.